In order to enable two-factor authentication on Netscaler gateway, we have to specify TOTPRadius as secondary authentication for XenApp/XenDesktop site. Login to Netscaler admin panel with nsroot and click on Configuration->XenApp and Xendesktop sites->Configured Virtual Servers . Click on Edit button next to the site you want to configure two-factor authentication for. Click on edit icon on the Authentication box. 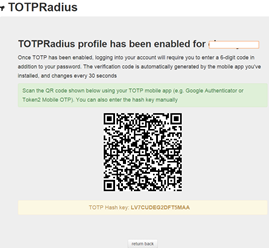 Set "Secondary Authentication Method" to RADIUS and enter the TOTPRadius appliance settings in the form below. Leave port as 1812. Radius secret is as specified in Admin Panel of TOTPRadius web interface. Click on "Continue", then "Done". 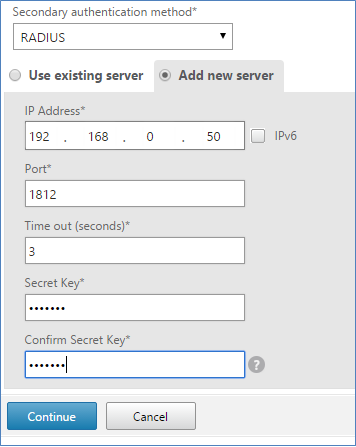 Once done, Netscaler interface will ask for two passwords (Password 2 is the field for OTP). TOTPRadius provides a RESTful API service to allow StoreFront integration. You have to install StoreFront integration package (described below) on all StoreFront servers in the cluster. Once installed and configured, users will see an additional status bar in the header prompting users to enable TOTP. Note! You should set "Allow initial login" to at least "1" in TOTPRadius Admin Panel to allow users to login and enrol second factor authentication. Storefront will use API calls to check if the current user has a TOTP profile enabled on the TOTPRadius server. To enable TOTP, users should click on "enable", then on OK button on the next popup. On the next login, the user should provide OTP generated by the mobile app in order to login. Users that enrolled themselves will still appear on TOTPRadius web interface and can be edited, banned or deleted by administrators. 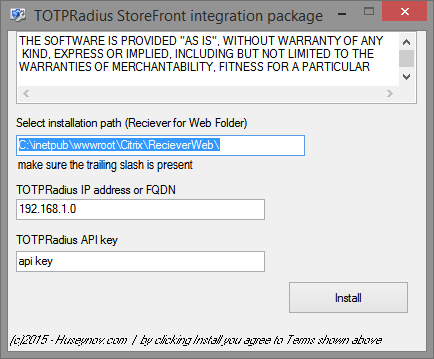 Download the TOTPRadius Storefront integration package and run the installer as administrator on the StoreFront server. - Specify the folder where your Reciever for Web Website is located. Make sure you include a trailing slash at the end. Note! Netscaler pass-through configuration should be done correctly in order for this customization to work. You can test it by accessing <YOUR_WEB_URL>/DomainPassthroughAuth/test.aspx . The page should show current user's domain, username and authentication type.